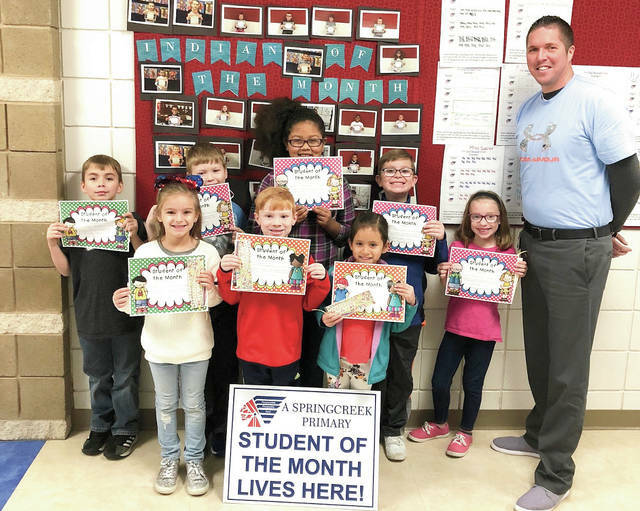 Provided photo Springcreek Primary School Principal Ross Loudenback stands with the school’s Students of the Month for November. Shown left to right, are, front row: Aryana Force, Owen Schulz, Aleigha Martinez; back row: Gabe Mackeller, Brayden Venrick, Maya Oduro, Levi Frost, Judah Frost. Springcreek Primary School Principal Ross Loudenback stands with the school’s Students of the Month for November. Shown left to right, are, front row: Aryana Force, Owen Schulz, Aleigha Martinez; back row: Gabe Mackeller, Brayden Venrick, Maya Oduro, Levi Frost, Judah Frost. https://www.dailycall.com/wp-content/uploads/sites/30/2018/11/web1_Student_of_the_month_November-02_cmyk.jpgProvided photo Springcreek Primary School Principal Ross Loudenback stands with the school’s Students of the Month for November. Shown left to right, are, front row: Aryana Force, Owen Schulz, Aleigha Martinez; back row: Gabe Mackeller, Brayden Venrick, Maya Oduro, Levi Frost, Judah Frost.